Pink-red lotus flower, detail of porcelain statue of Pu-Tai (Hotei) Buddha / Maitreya Buddha, China c 1900. This Pu-Tai greets anyone/everyone to whom my front door opens. He’s been with me a long time. Pu-Tai is one of my favorite buddhas, enlightenment beings, of all traditions, all lands, and all times. He is revered in slightly variant forms throughout the Buddhist world. Some scholars have identified him both with Shri Ganesha on the one hand, and with Santa Claus on the other! I like the idea of all three of these wonderful bundles of wise-joy being, at some level, different manifestations of the same one being. And in way, of course, they are, just as in a similar/identical way, we all are! The image of Pu-Tai with young children climbing all over him is one of the most popular, and one of my favorite representation of this jovial avuncular buddha. His Holiness the Dalai Lama kept such a statue, quite similar to this one, in his personal chambers at the Potala monastery palace when he resided there before having to flee to safety and freedom in India. The small porcelain Pu-Tai statue is still there in his former bedroom. This particular motif reminds me of when my nieces & nephews were very young and loved to climb all over me in a gentle pretend wrestling &/or horse-riding play on the carpets and lawns whenever/wherever we would gather. Such wonderful fun & pure joyous giddy love! Giddyup. The delicately pink flower in this very fuzzy photo bloomed overnight and said hello to us the morning after my sweetie and I moved into our home here in the urban desert ten years ago. A lovely morning greeting blessing gift! Everywhere she went, my wife inspired flowers to open. It was uncanny but from the beginning utterly convinced me of her uniquely magic heavenly-earthly presence. The first time we met, I’d walked up the back path to my favorite bookstore-coffeeshop. It turned out to be hers too. There were tall wild weeds growing along the walk when I arrived in the early evening gloaming, but no blossoms. She came up the same path a few minutes later. We left together several hours later, having met by chance for the first time in the shop and talked til we closed the place down and they shooed us out the door. As we walked down the path together in the dark, several of those wildflower weeds were now in bloom. It was almost weird, but I instantly suspected something heavenly was “afoot” and “abuzz” surrounding the whole situation, or I should say surrounding the whole person I was walking/floating along side of. I know you will think I’m speaking symbolically and hyperbolically. Nope. Not even. Pu-tai’s story is fascinating. He was a Chan (Zen) monk named Qiè-cǐ who lived during the Later Liang Dynasty (early 10th century). He was a native of Zhehiang, and legendary during his lifetime for his longevity, jovial carefree eccentric nature, his mutual magnetic affinity with children, his serene utter poverty, his unstinting generosity, and uncanny insight. At the time of his death he revealed himself as an incarnation of Maitreya, the Buddha of the future. Maitreya resides in the Tushita Heaven awaiting his time of appearing in a vastly distant future age as the next supreme Buddha of the Earthly plane. Maitreya became curious about the welfare of the Earthly beings He is entrusted to care for during his future embodiment on Earth. So He made a brief, advanced, incognito appearance in the form of the humble Zen monk and holy fool Pu-Tai. He enjoyed himself so much, He stuck around for well over a hundred years. 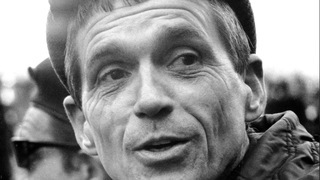 We spend the hour remembering the life and legacy of the legendary antiwar priest, Father Daniel Berrigan. He died on Saturday, just short of his 95th birthday. Berrigan was a poet, pacifist, educator, social activist, playwright and lifelong resister to what he called “American military imperialism.” Along with his late brother Phil, Dan Berrigan played an instrumental role in inspiring the antiwar and antidraft movement during the late 1960s, as well as the movement against nuclear weapons. He was the first Catholic priest to land on the FBI’s most wanted list. 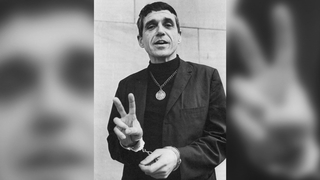 In early 1968, Father Daniel Berrigan made international headlines when he traveled to North Vietnam with historian Howard Zinn to bring home three U.S. prisoners of war. Later that year, Father Dan Berrigan, his brother Phil and seven others took 378 draft files from the draft board in Catonsville, Maryland. Then, in the parking lot of the draft board office, the activists set the draft records on fire, using homemade napalm, to protest the Vietnam War. They became known as the Catonsville Nine and invigorated the antiwar movement by inspiring over 100 similar acts of protest. It also shook the foundation of the tradition-bound Catholic Church. Then, in 1980, the Berrigan brothers and six others began the Plowshares Movement when they broke into the General Electric nuclear missile facility in King of Prussia, Pennsylvania, hammered nuclear warhead nose cones and poured blood onto documents and files. They were arrested and charged with over 10 different felony and misdemeanor counts, and became known as the Plowshares Eight. In early 1968, Father Daniel Berrigan made international headlines when he traveled to North Vietnam with historian Howard Zinn to bring home three U.S. prisoners of war. In the documentary Holy Outlaw, Father Dan recalled spending time in Vietnamese shelters while being bombed by U.S. jets. a Hiroshima child from hell. AMY GOODMAN: On May 17th, 1968, Father Dan Berrigan, his brother Phil and seven others took 378 draft files from the draft board in Catonsville, Maryland. Then, in the parking lot of the draft board office, the activists set the draft records on fire, using homemade napalm, to protest the Vietnam War. They became known as the Catonsville Nine. The act of civil disobedience was chronicled in the 2013 documentary Hit & Stay: A History of Faith and Resistance. This begins with Father Dan Berrigan. AMY GOODMAN: Father Berrigan and other members of the Catonsville Nine were arrested on the spot. The draft board raid invigorated the antiwar movement by inspiring over a hundred similar acts of protest. It also shook the foundation of the tradition-bound Catholic Church. In 1970, Father Dan Berrigan spent four months living underground as a fugitive from the FBI while his conviction was under appeal. INTERVIEWER: During the time he was in hiding, Father Berrigan changed his location often. He stayed with 37 different families in 10 Eastern and Midwestern cities. Well, Father Dan, you’ve been underground for some time now. What’s it like to be underground in the United States of America? FATHER DANIEL BERRIGAN: Well, I’d say that it looks as though it could go on forever. It looks good enough, looks useful enough, for the movement. LIZ McALISTER: So there were some, what, four months that they looked for Dan, everywhere. And he was everywhere and available to everyone, except the FBI. AMY GOODMAN: That’s Liz McAlister, Phil Berrigan’s wife, in the film Hit & Stay. In 1980, the Berrigan brothers and six others began the Plowshares Movement when they broke into General Electric nuclear missile facility in King of Prussia, Pennsylvania. The activists hammered nuclear—on the nuclear warhead nose cones and poured blood onto documents and files. They were arrested and charged with over 10 different felony and misdemeanor counts. They became know as the Plowshares Eight. And I want to turn now to a clip from the film In the King of Prussia. This scene features Dan Berrigan reciting what he told the judge and jury during the trial. AMY GOODMAN: An excerpt from the film In the King of Prussia, directed by Emile de Antonio. In the film, the actor Martin Sheen played the judge in the trial. We continue our interview with close friends and the niece of the legendary antiwar priest, Father Daniel Berrigan, as we remember his life and legacy. He died on Saturday, just short of his 95th birthday. Berrigan was a poet, pacifist, educator, social activist, playwright and lifelong resister to what he called “American military imperialism.” Along with his late brother Phil, Dan Berrigan played an instrumental role in inspiring the antiwar and antidraft movement during the late 1960s, as well as the movement against nuclear weapons. He was the first Catholic priest to land on the FBI’s most wanted list. In early 1968, Father Daniel Berrigan made international headlines when he traveled to North Vietnam with historian Howard Zinn to bring home three U.S. prisoners of war. Later that year, Father Dan Berrigan, his brother Phil and seven others took 378 draft files from the draft board in Catonsville, Maryland. Then, in the parking lot of the draft board office, the activists set the draft records on fire, using homemade napalm, to protest the Vietnam War. They became known as the Catonsville Nine and invigorated the antiwar movement by inspiring over 100 similar acts of protest. It also shook the foundation of the tradition-bound Catholic Church. Then, in 1980, the Berrigan brothers and six others began the Plowshares Movement when they broke into the General Electric nuclear missile facility in King of Prussia, Pennsylvania, hammered nuclear warhead nose cones and poured blood onto documents and files. They were arrested and charged with over 10 different felony and misdemeanor counts, and became known as the Plowshares Eight. We are joined by Frida Berrigan, niece of Daniel Berrigan, and a longtime peace activist herself. She writes a regular column for Waging Nonviolence. We are also joined by John Dear, a Catholic priest and longtime peace activist who is Berrigan’s literary executor and the editor of five books of his writings. And joining us in New Orleans is Bill Quigley, who was one of Daniel Berrigan’s attorneys. He is a professor and director of the Stuart H. Smith Law Clinic and Center for Social Justice, as well as the Gillis Long Poverty Law Center at Loyola University. Watch more of our look back at Father Daniel Berrigan’s life. AMY GOODMAN: This is Democracy Now!, democracynow.org, The War and Peace Report. The legendary antiwar priest, activist and poet, Father Dan Berrigan, has died at the age of 94. 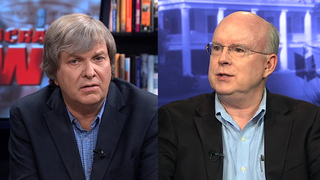 This is Part 2 of our discussion, following our global broadcast, with three guests remembering his life and legacy. In New York, we’re joined by Frida Berrigan. She’s the niece of Dan Berrigan. She’s the daughter of Father Dan Berrigan’s brother, Phil Berrigan, she herself a longtime peace activist, very much following in the tradition of her family, of her father, Phil Berrigan, her uncle, Dan Berrigan, and her mother, Liz McAlister. Frida writes a regular column for Waging Nonviolence. Also in New York, Father John Dear, a Catholic priest, longtime peace activist, one of Dan Berrigan’s closest friends, worked with him for 35 years. He’s Father Dan’s literary executor and the editor of five books of his writings. We’re here in New Orleans, Louisiana, and joined in the studios of public television station WLAE by Bill Quigley, professor and director of the Stuart H. Smith Law Clinic and Center for Social Justice, and the Gillis Long Poverty Law Center at Loyola University, one of Dan Berrigan’s attorneys. We welcome you all back to Democracy Now! Now, we ended with you, Bill, telling us about an action that you represented Father Dan over. But I was wondering if you could elaborate a little more that, now that we have more time. Explain exactly when it was, back in 1989, and what Father Dan did, the circumstances, what he was protesting and what he did. BILL QUIGLEY: Well, Father Dan was, at that time, teaching at Loyola University in New Orleans. And the Jesuits, as talked about, were assassinated at the university in Salvador. AMY GOODMAN: These were the six Jesuit priests, their housekeeper and her daughter. BILL QUIGLEY: Correct. And there was a nationwide call for civil disobedience to resist U.S. policy in El Salvador. And I was called to a meeting at Loyola by a group of people who were going to engage in civil disobedience, they said. And I’ve been to many meetings like that over the years. And there in the group was Dan Berrigan, and I realized, because he was there, that this was a very serious group. He didn’t try to be the leader. He didn’t try to be outspoken or anything. He was quiet and a presence there as the group decided what they were going to do. And they decided they were going to go to downtown New Orleans into the Federal Building and block all of the elevators in the Federal Building so that business could not continue as usual on a Friday afternoon. He, along with other Jesuit priests, some students, some other antiwar activists in the community, sat in these elevators and just peacefully prayed and sang and stopped all the business in the Federal Building for some time. AMY GOODMAN: Explain who the provincial—what the provincial is. AMY GOODMAN: The former U.S. attorney general. BILL QUIGLEY: The former U.S. attorney general, who represented him on many things. I’m one of dozens, if not hundreds, of lawyers for Daniel Berrigan, because of his activities over the years. And he had been arrested and kept in jail in New York, because he had skipped the trial in New Orleans. He agreed to come back. Somebody posted a bond for him. He came back a few weeks later to face this horrifying contempt of court charge for, you know, skipping out on court and the big threats of going to jail. And, of course, he was not intimidated whatsoever by going to jail. He took the courts very gently. You know, they had a job to do. Do whatever you want to do; we’ll do whatever we have to do. And so, when he came to court, people were afraid that he was going to be kept in jail in New Orleans for a while. So, his good friend, the president of the United States on our TV show, Martin Sheen, came down as a character witness for him. And the two of them, when they came into the courthouse, essentially, shut down the entire courthouse, because everybody wanted to see Martin Sheen and Daniel Berrigan. So all the other courts closed, a lot of the Federal Building. People streamed in to see him. And they were charming, and they were light, and they were laughing. And they told how serious it was and what they had done and the like. And the judge ultimately gave him some community service hours that he had to follow through on, which, of course, his life was made up of community service. But he was a very quiet but forceful leader with people. He would speak when asked to, and when he did speak, he was powerful. But he didn’t go out of his way to make a lot of speeches. BILL QUIGLEY: Right. Well, actually, you know, hundreds of thousands of people, I think, considered him a hero. And so I asked him on the stage, and we had not rehearsed, so I didn’t know what the answer was. And I asked him, you know, “Who are your heroes? Because you’re a hero to so many.” And he said, “Bill,” he said, “I don’t believe in heroes. I believe in community. And it is in community, it is in movements, it is in people gathering together, that courage is displayed, that inspiration happens, that sacrifice happens and the like.” And we have seen, and celebrate, even after his death now, the hundreds of activities and communities across not just the United States, but Europe and around the world, who have adopted many of the activities and the actions that he has done, the Plowshares Movement. There is a young woman in Omaha this month who is going to trial—I’m representing her, standby counsel—Jessica Reznicek, who broke out the windows of Northrop Grumman in—outside a Air Force base there and to resist the next generation of weapons of mass destruction that they are making so much money off of. The Sister Megan Rice, who’s been on your show before, Michael—[Greg] Boertje-Obed, John Dear, Frida—there’s just hundreds and hundreds of people and hundreds and hundreds of actions of this community of peacemakers. And that is really, I think, his legacy to us, as a prophet, as a truth teller, but also as a community builder and inspirer and as an activist himself. AMY GOODMAN: I want to turn to actor Martin Sheen, who played Father Dan Berrigan [sic] in the 1982 film [In] the King of Prussia, which tells the story of how Berrigan and others became active in the nuclear weapons—the antinuclear weapons movement. And still I didn’t—I didn’t join Dan for a protest until 1986. I was in New York doing a film, and I had a day off. And so, I heard about a demonstration over at the 42nd Street, and trying to block the entrance to where—you know, the McGraw-Hill Building, when they were planning basically to place nuclear weapons in outer space. This was the so-called—Reagan’s strategic plan, Star Wars. And I went to that demonstration, and Dan was there. And it was my first arrest for a noble cause, and it was the happiest day of my life, and I’ll never forget. It was so disarming. Dan was, you know, kind of leading the group in prayer and singing. And the police finally arrived and said, “Now, come on, you guys. You’ve got two minutes to disperse.” And Dan said to the presiding officer, “Come on, Officer, you believe in this cause. Get in here and join us.” And he backed away and said, “Oh, no, no, Father, please, please, don’t.” He made it so human, so down to earth. But the world has lost a great peacemaker and humanitarian and poet and such an inspiration and such a—you know, it’s hard to describe the effect he’s had without becoming—I don’t know what. It’s like you’re describing someone that could not possibly have lived, and yet we knew him and loved him and worked with him and celebrated with him. And in a few days, we’re going to gather to celebrate his life and to send him on his way. AMY GOODMAN: The action you’re talking about, Bill, that Father Dan was involved with, was protesting the killing of six Jesuit priests, their housekeeper and her daughter in El Salvador. Why was he occupying the Federal Building here in New Orleans? What did the U.S. government have to do with it? BILL QUIGLEY: So, the—he was, as so many were—felt terribly bad about the murder of these folks. But the problem was that they were really murdered by the United States government, not directly, but indirectly. The people who threatened the Jesuits, who had threatened and murdered and assassinated people all over Latin America and South America, had been trained by the U.S. Army School of Americas, which was originally in Panama, has since been moved to Fort Benning and renamed other times, but it was United States policy that pushed, funded, trained and activated the people who killed these Jesuits, their housekeeper, other sisters, other peasants, other activists, labor organizers and the like. AMY GOODMAN: I wanted to go back then, from 1989 to 1968, to the Catonsville action, when he and eight others, Father Dan, as well as his brother, Phil Berrigan, and other peace activists burned the A1 draft files, over 300 of them, in Catonsville, Maryland, using homemade napalm. The statement that Father Dan Berrigan wrote famously said, “Our apologies, good friends, for the fracture of good order, the burning of paper instead of children.” Frida Berrigan, if you can talk about, well, the beginning of the whole Plowshares Movement, what your father, Phil Berrigan, and Dan Berrigan—how they decided to engage in this kind of direct action, that would carry on for decades and carry on—carries on, you know, beyond the lives of both Phil and Dan Berrigan now? FRIDA BERRIGAN: Well, I think the key word here for the Plowshares Movement is “responsibility.” My father, my mother, Uncle Dan, the Plowshares community took nuclear weapons personally. They felt personally—feel personally responsible for the fact that the United States holds the wherewithal to destroy our entire planet hundreds, perhaps thousands, of times over, and that we threaten on a daily basis—that the United States threatens on a daily basis the world, the whole world, with a nuclear winter. So, as Christians, as peacemakers, as people of conscience, they said, “We are responsible for these weapons. And our faith calls us to disarm them, to transform them.” And so, in order to do that, there’s walking through fences, there’s going over sensors, there’s breaking into buildings, and there’s a taking responsibility for these weapons. So that was a real thread throughout our whole lives, is we are responsible. We can’t just say, “Oh, well, the people in Washington have that under control.” We are responsible. And so, my father, Uncle Dan, my mother, so many others risked long times in jail, risked—risked everything, risked being away from—being away from us. Who would want to be away from me as a small child, right? And so—and then that idea really took off. There have been hundreds of Plowshares actions. There—perhaps there are Plowshares actions being planned and conceived of right now, where people of conscience feel this call out of the Hebrew Scriptures, the Old Testament prophets, Micah and Isaiah, to beat swords into plowshares, to turn spears into pruning hooks, to make weapons into implements of life. So, it was such a—such a courageous idea to be gripped—to take something off a page and to put it into life. To take something written 2,000 years ago and say, “This is—this is what I need to do,” is such a—such a profound and just out-there thing to do, and yet it has gripped so many people. And it certainly set up our lives, as the children of Phil and Liz, the nieces and nephews of Dan Berrigan. It set up our lives, where many family reunions were held outside of courthouses and in prison visiting rooms throughout our—throughout our lives. And the function of poetry and prophecy in our lives has just been—well, it’s been strange. You know, it’s been strange, but it has been magical, too. And so—and I think that the reverberations of these witnesses are things that, you know, will live on in the world for generations to come. And I take great comfort—I take great comfort in that. AMY GOODMAN: In 2006, the late author Kurt Vonnegut spoke at the celebration of Father Dan’s 85th birthday in New York. AMY GOODMAN: That was Kurt Vonnegut, speaking at the 85th birthday party of Father Dan Berrigan. And this is the historian Howard Zinn, the late, great historian, who wrote A People’s History of the United States, also speaking at that same event in 2006 marking Father Dan Berrigan’s 85th birthday. HOWARD ZINN: I met Dan in early 1968 for the first time. We met in an apartment in Greenwich Village, and in a few hours we were on our way to North Vietnam, traveling halfway around the world. And although we had never seen one another until that day, we were going to spend the next three weeks or so very closely together. We were there to bring back these three first flyers released by North Vietnam. And let me say that meeting Dan Berrigan has been one of the most important moments of my life, really. And, really, every—every day that we were in Hanoi—we were there for about a week, and every day that we were in Hanoi, we had a very, very full day. And it was a busy time. And then, at the end of the day—we both had our little hotel rooms in this old French hotel. At the end of the day, before going to sleep, Dan would come to my room. And he traveled with a very tiny—I wouldn’t call it a suitcase. Something very small. And—but it’s—but he pulled out of it every night a little bottle of cognac. And I had a feeling that there wasn’t much else in this bag. And so, we would have a little bit of cognac, and then we would both retire. And the next morning, we would meet at breakfast, and Dan would have a poem. I didn’t know when he wrote it. I supposed it was while he slept. But every morning, another poem. And that was the beginning of my friendship with Dan, which would continue. He introduced me to the—what can I call it? The Catholic left? Dare I use the word “left”? The Catholic antiwar movement, to Phil and Liz and Tom and all the others. You know, what a remarkable group. And then, of course, Dan and I, we became entangled with one another in a number of ways through the course of the movement against the war in Vietnam, a period when he came to Boston and was underground, and I was, as the FBI would say, his handler. And—but I can actually never handle him. You know, and I—there were all those things he did afterward, which you know about, from the Catonsville Nine through all the others. I’ve had it, they said. It’s too much, they cried. Some walked and walked and walked. AMY GOODMAN: That was the late, great Howard Zinn, talking directly to Father Dan Berrigan, celebrating his 85th birthday. John Dear, if you can go through what in the beginning inspired Dan? I mean, you have Phil Berrigan and Dan Berrigan. Phil, I think, engaged in these actions a little earlier, maybe encouraged his brother to do the same. But talk about when Father Dan decided that this is the course of action he would take in his life. FATHER JOHN DEAR: Thank you, Amy. You know, we’re talking about Dan as this great resister. But, you know, he was famous in the early ’60s as a poet, so he was a—he was actually a great literary person, as well, I think one of the great poets of the time. And he was also a very serious religious leader as a Catholic priest. And so, Dan entered the Jesuits in 1939. He and his family were very much pro-war. In the ’50s, Dan is very involved in the church and is a teacher. What happened—and I pressed Phil on this, and Dan later—is that the FOR reached out to him around 1960, and to Thomas Merton and to Thich Nhat Hanh, and got them really involved—the Fellowship of Reconciliation—in beginning to speak out against war and nuclear weapons. And then they went through this transformation, with Thomas Merton, kind of under the guide of Dorothy Day, Dan’s great friend, and she was really Dan’s leader, if you will. And Dan was in Europe in 1964. AMY GOODMAN: Founder of the Catholic Worker Movement. AMY GOODMAN: And explain who Thomas Merton is. AMY GOODMAN: Kicked out of the country by? FATHER JOHN DEAR: Well, these are great questions. For years, we thought it was the cardinal of New York, who was a very famous pro-war leader, Cardinal Spellman. He used to go to Vietnam and literally bless the troops. Dan always thought it was him, but research was done, and we discovered about 10 years ago it was secretly the Jesuits themselves. Cardinal Spellman didn’t do that. They kicked him out of the country to try to stop him from speaking out against war. But there was such an outcry. Friends took out a full-page ad in The New York Times. Dan came back. And then he got invited with the Cornell students to go to the big mobilization at the Pentagon. We’re talking now October 1967, a week before Phil’s Baltimore Four action. Dan didn’t plan to get arrested. All his student friends got arrested, so he got arrested, and the first priest to do so. And then Phil did the action. And then, suddenly the invitation happened for him and Howard Zinn to go to Vietnam. We’re now talking January 1968. If you study the correspondence with Merton and Phil, none of this was planned out. It was unfolding as the war was getting worse. They are now prominent people, but they’re saying, “OK, students are speaking and marching, and young people are marching against the war. The war is clearly getting worse. The election is going to happen.” Bobby Kennedy hadn’t got—so forth and so on. “What are we going to do?” And being in Vietnam changed Dan’s life. And then the death of Martin Luther King kind of led Phil and Dan to take another step. And, Amy, you know, listening to that quote, it’s so hard and shocking to really imagine what they did, but when Dan said, “Our apologies,” “We apologize,” Sorry, dear friends, we can only burn paper instead of children,” you know, the whole country freaked out that priests were breaking the law in opposition to the war. But very few were quite upset, you know, about the bombing and dropping of napalm upon millions of people in Vietnam. And they—the symbolic action of pouring napalm on draft files, leading to 300 other draft board raids—ending the draft—we know historically it ended the draft. It changed the Catholic Church, and it inspired tens of millions of people to take to the streets. I would say that very seriously, having really studied it and talked at length with Dan and Phil about that. And then you’d say, after prison, which was so horrible—Dan almost died in prison—well, they could rest on their laurels and be great heroes of the peace movement. Not at all. They kept going, addressed nuclear weapons. Phil founded Jonah House, and then they did the Plowshares Eight—at great cost. Dan’s health has never been that great. He faced a good 10 years in prison. He eventually did not go to prison for that. But they kept at it. And Dan always continued his love of language. So powerful. That’s why he’s so interesting to listen to. And he was a great spiritual giant, certainly on the level of Dr. King and Gandhi, but—and Dorothy Day, his friend, but also his other friends, Thomas Merton; Rabbi Abraham Heschel, close friend of Dan’s; our friend Thich Nhat Hanh, the great Buddhist leader, who’s near death himself. They had a big celebration of Dan yesterday in Plum Village in France, and I’ve been in contact with him. So, Dan, as a religious figure, saying if you’re going to pursue the spiritual life, you have to work to end the killing of sisters and brothers around the planet, this is a great gift Dan has given all of us and a great hope and a symbol. And what a blessing, Amy, for all of us to have known him. AMY GOODMAN: I want to end with two separate comments. This is from filmmaker and activist Michael Moore, who recorded a statement remembering Father Dan Berrigan. MICHAEL MOORE: I was deeply saddened this weekend to learn the news of the passing of Father Daniel Berrigan. But truth be told, I have, throughout my life, been overjoyed at the fact that both he and his brother, Philip Berrigan, were perhaps the main inspiration to me as a child, as an adolescent, a young 13-year-old back in Catholic grade school myself in Michigan, and being inspired by them in what they were doing to try and stop the Vietnam War. And I made a decision that basically I wanted to be them. I was not your typical 13- or 14-year-old. But in many ways I was. But one thing I knew for certain is that I wanted to do what they were doing. And I have to say that what I have been able to do throughout my life, I can draw a direct line back to following them, following their example, reading what they wrote, listening to what they had to say. And I’ve been asked many times in the past in terms of, you know, who inspired me or who—you know, who was a mentor to me or whatever, and if I had any heroes as a teenager, Daniel Berrigan and Philip Berrigan were at the top of the list. I’m sad to see him go, but I am so glad that he was part of my life, of our lives, of this country’s life, of this world. And I guess I’m optimistic knowing that there are so many millions of others just like him, maybe not as famous, but I know some of them are listening to this right now, some of you, who are, in your own ways, in your own communities, doing the things that need to be done, fighting the good fight, continuing the struggle, and doing it with love and kindness and a sense of what’s right and wrong and fair and just. And if we all keep doing that, then that means Daniel Berrigan lives on. AMY GOODMAN: That was Michael Moore. And I want to end with Father Dan Berrigan in his own words, in our firehouse studio in 2002, reading a poem about his brother, Phil Berrigan. FATHER DANIEL BERRIGAN: An anniversary like this induces—seems to me, induces silence rather than a lot of words, but I’ll try. A few minutes after this horrid event a year ago, the phone rang. I was working at something. And a friend from North Carolina said, “Something terrible is happening in New York City.” And I said, “What?” and so on and so forth. And my first reaction was, I guess, right out of the gut rather than the heart, and I blurted into the phone, “So it’s come home at last.” Sympathy and tears came later, but that was the beginning. And I had a sense that that came from a very deep immersion in what I might call a hyphenated reality of America-in-the-world, hyphen in-the-world. AMY GOODMAN: That was Father Dan Berrigan speaking in 2002. He died on Saturday at the age of 94. I want to thank our guests, Frida Berrigan, John Dear, both in New York, and Bill Quigley, here in New Orleans with me. That does it for our show. We will link to all our interviews with Dan Berrigan over the years at democracynow.org. Special thanks to Mike Burke, Jeremy Scahill, Denis Moynihan, the whole team at Democracy Now!, Brendan Allen, Renée Feltz, Nermeen Shaikh, Deena Guzder, Carla Wills, everyone who made this broadcast possible, as well as Amy Littlefield and Sam Alcoff and Laura Gottesdiener. I’m Amy Goodman. This is Democracy Now! Sambhogakaya “Body of Perfect Enjoyment” (Sanskrit sam all, perfect; bhoga enjoyment; kaya body). My bathroom nicho: antique Japanese Daruma doll, Indian conch seashell, and Chinese cloisonné offering bowl holding ten-year old bougainvillea blossom from my yard. Daruma (Bodhidharma) doll, papiermaché, Japan, c. 1900. Bodhidharma (5th-6th century AD) was the first Buddhist master to bring the teachings of the Indian Dhyan (Meditation) Sect of Buddhism to China, becoming the first patriarch in China of what became known as Chan (Chinese for Dhyan), and Zen in Japan. Bodhidharma is variously said to have been an ethnic Persian or Sogdian from a Central Asian kingdom steeped in Indian Buddhist culture, or a prince of a South Indian brahmin dynasty. He became a Buddhist monk and priest (said to be in the 28th disciplic generation from Lord Shakyamuni Buddha, himself born as an Indian Hindu prince). Bodhidharma is said to have settled at Shaolin Monastery in China where he founded the Shaolin martial arts tradition of Kung Fu. The Indian Vedic master, Maharishi Mahesh Yogi, once told me that his Shankaracharya Tradition of Vedic Yoga and Advaita Vedanta contained historical records identifying Bodhidharma as a former student within the Tradition who later taught his Vedanta-informed personal understanding within an Indian Buddhist context, before leaving for China. There is much controversy regarding the historical origins of various Buddhist traditions in relation to the Vedanta and Yoga traditions of India. Bodhidharma (Japanese Daruma) is held within the Chan/Zen tradition to be a fully enlightened bodhisattva, ie a buddha. Chinese offering bowl, cloissonné on brass. A birthday gift from my sweetheart, one of the few items to survive a 1995 fire that destroyed our Berkeley home, school, and studio. The heat blackened one of the darker green enamel colors of the bowl. In the Vedic/Hindu and Buddhist traditions, the conch shell is sacred. Small shells are often used to pour water offerings in yagyas and pujas, traditional ceremonial thanks-offering ritual performances. Larger shells are often used as ceremonial trumpets during such performances. Because of sounds made by shells (on their own, when held to the ear, or when blown as trumpets), they are symbolic of the divine primordial sound of creation (AUM, and all the 8,400,000 bija mantras), the voice of the Gods, and the speech aspect of Buddha-nature. Rosary (mala) beads are made from conch shells, and specially triturated (finely powdered) conch shell is used in many traditional Ayurvedic medicines and other indigenous Indic and Tibetan medical systems and in internal Tantric alchemy. Bougainvillea blossom (resting in Chinese bowl). Bright red-purple when it fell from our front yard trellis-bush the day we moved in, ten years ago, I placed the delicate flower in this bowl as a nicho offering to the bathroom gods. It has rested there ever since, fading to an almost transparent light brown-cream color. In Japanese Zen temples, it is traditional to have a small altar shelf or niche in the bathing house, and in the latrine outhouse. This is my homage to that tradition. was brushed in 2002, while living in Strawberry, Marin County, the northern peninsula of the Golden Gate, San Francisco Bay/Richardson Bay, California. This photo is a detail of the full painting.